Our newest team member shares some insight on his first experiences working at nFuse. Just after finishing college, I was immediately looking forward to getting my first “real” job. Soon after graduating I came in contact with nFuse. During my internship over at Gluo (Xplore Group) I already got to know nFuse and their services on a very high level, this made getting to know one another a bit easier. When all agreements were set in stone, I basically couldn’t wait to get started over at nFuse. 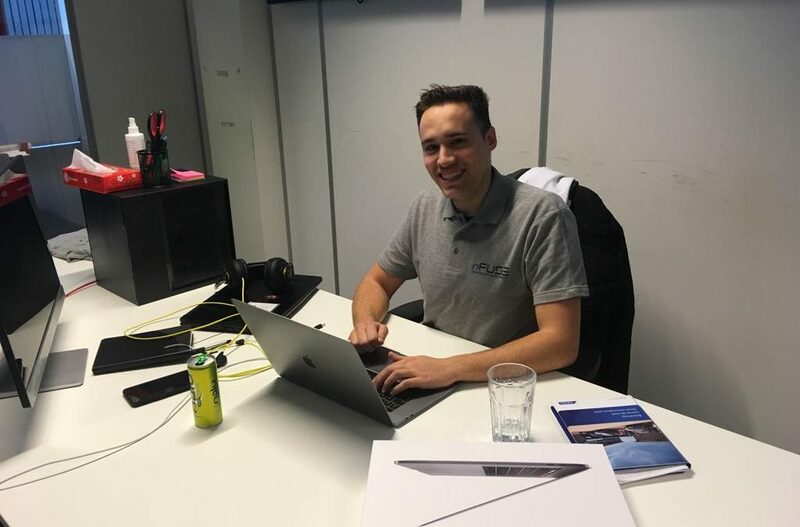 Getting to work on the very first day was quite a pleasant surprise as the team had prepared a so-called “Welcome Package” containing some essential tools such as a top-notch laptop and various other goodies. The first few days I managed to get my laptop up-and-running with all the required tools. Shortly after the real work began: getting acquainted with all customers, technologies, projects and their infrastructures. At first the tasks seemed easy and quite straight-forward, however the larger my knowledge grew, so did the size of the issues I was facing. Each and every day has been filled with new and unique challenges, which made every day more exciting than the one before. But hey, time flies when you’re having fun right? As the weeks went by the nFuse team kept giving me more and more challenging tasks, to test my resilience and perseverance I suppose. At first it felt like a (over)load of information however I feel like I’ve managed my stress quite well during these weeks. Soon after, I received the news that the team deemed me ready to take on the first on-call shift. Since nFuse’s services are on a 24/7 basis this day had to come eventually, but since I had been fed all required intel, I had great confidence in taking on my first shift, which turned out to be quite a tranquil one. All in all, I’m quite the happy camper over here. An experienced team to work with on a daily basis, loads of freedom (which I pledged not to abuse) and new challenges to face every day to keep me on my toes. I wonder what nFuse still has in store for me the next few years.